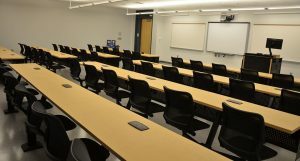 I have some compelling reasoning for you regarding how Interactive Presentation Technology will benefit your school (financially and pedagogically), and why you should consider bringing Interactive Presentation Technology into your classes / lecture theatres. Interactive Presentation Technology = Interactive LCD Panels / whiteboards, Interactive Projectors. 1: It will make teachers happier and better at teaching. 2: It will make students happier and better at learning. 3: It will make the school look better in the eyes of prospect families and therefore aid the school in attracting students, and student fees. I’ve written an essay offering some academic justifications supporting the 3 big claims above, and suggesting why everyone else should get as excited by these tools as I am. To read the complete essay click here. 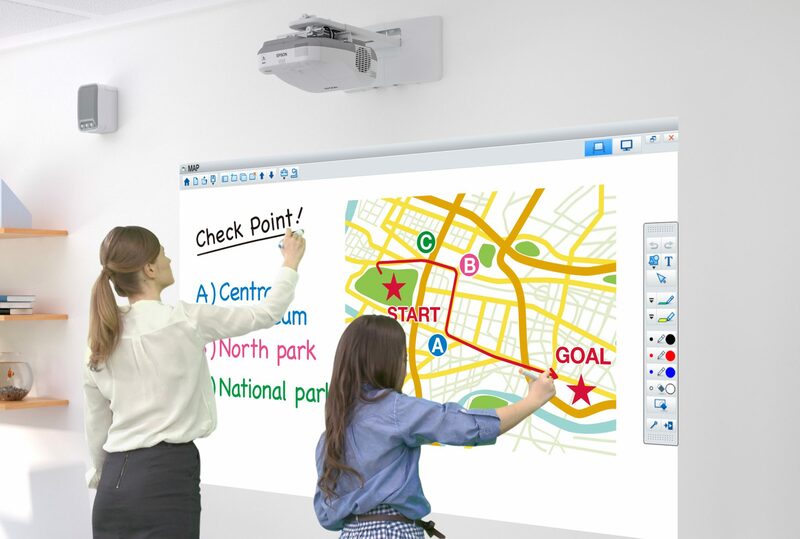 Interactive Presentation Technology (interactive panels, interactive projectors) when combined with the delivery of a good teacher, will aid learning. This benefits students, teachers, and schools alike. Personal observations about IPT and support for same by lots of teachers and professional presentation type folks. a) Interactive Presentation Technology will aid in their task of educating. Using the two arguments above, to influence the Decision Maker(s) from multiple angles, with compelling arguments beyond simple ‘cost leadership’ against competing (cheaper) presentation technology, that they might apply a more multi-dimensional analysis of ROI when considering capital purchases: Interactive Presentation Technology is a sound investment. An interactive projector at the front of the classroom provides two-way media interaction between the presenter and the recipients. You can still do everything you could do with old fashioned white boards / black boards. You can manipulate visuals in the same way as with tablets / smart-phones. All sorts of devices can be used as inputs / shared onto the screen and their contents can be manipulated from the screens: Computers, tablets, smart-phones, direct input from keyboard………..
What’s on the screens can be shared online: Snapshot and share……. A popular model used to describe why people do what they do / think what they think. The Theory of Reasoned Action posits that behavioural decisions are based on reasoned consideration of all available information, and that the intent to engage in an activity is a relatively reliable indicator the behaviour will be forthcoming. Antecedent to intention are attitudes to the activity, and subjective norms: The attitude is based upon behavioural beliefs about the activity, and subjective norms are based on normative beliefs. This is based on our processing of communicative cues received in a social environment. People send and receive signals all the time to build and support their social identity. To be happy, it is essential our Identity assumptions / projections are supported by other people. All via semiosis, we project a version of ourselves to ‘significant others’, expecting reflective cues that suggest their version of our identity is suitably close to our version of our identity. Symbolic Interactionist perspectives are used to explain how attitude (as approached by TRA) is a social product: Attitude formation is influenced by what we think other people think about us. Symbolic Interactionist perspectives are used to explain how subjective norms (as approached by TRA) are social products. The formation of subjective norms is influenced by what we think other people think about us. Self-Congruity Theory states the appraisal of our Identity efficacy incorporates judgments about the extent to which our consumption patterns validate our Identity. Therefore we are judged by our association with products. As well as the obvious communicative devices we use in semiosis (speech, body language, normative attire, proxemics etc. ), objects around us also serve to transmit messages about who we think we are. The tools we use as we go about our day form part of the communicative toolkit that conveys our Identity. Therefore the tools we use as we go about our day are, processed by the people we interact with, as representing an aspect of who we are. How Interactive Presentation Technology nourishes Identity Work in The Educator and how that improves education outcomes. Major Premise: The primary defining attribute of Role: ‘Educator’ is the ability to transfer knowledge to The Student. Minor Premise: This tool aids in the transfer of knowledge. Conclusion: This tool therefore supports the primary defining attribute of Role: ‘Educator’. Major Premise: Anything used by The Educator which aids in the education process nourishes Self Identity in Educators. Minor Premise: Using Interactive Presentation Technology aids in the Education Process. Conclusion: Using Interactive Presentation Technology nourishes Self Identity in Educators. Therefore, the teacher is happier when using Interactive Presentation Technology because their Identity goals are supported. How Interactive Presentation Technology nourishes Identity Work in The Student and how that improves education outcomes. The same positive appraisal outcomes as were outlined for teachers can be ascribed to the Identity work of the students, in that they’d regard themselves in an esteemed light based on: A) Improved knowledge uptake, thus supporting Role Identity ‘Smart Student’, and B) their manifest consumption patterns in the category: ‘Educational Institution’ and the positive appraisal valence as would be evidenced through interacting with the most up to date equipment to support Role Identity ‘Modern Person / The Next Generation / The Future’. There is much debate about the extent to which rational thinking is filtered by, or even overstepped altogether by emotional thinking (affect). Many schools of thought suggest emotional judgement occurs prior to cognitive processing. Therefore negative affect (emotional judgement) gets in the way of thinking. Applying the logic of Classical Conditioning, it can be asserted that students find themselves processing the information content in a lesson as filtered by their attitude towards the medium, thus disengaging from the message if the medium does not entertain / engage them in the same way as their other interfaces with information / entertainment. Conversely, engagement increases should the student find the presentation platform is congruent with their interface expectations: If they like the medium, learning improves. This article suggests the Student will like the medium when the medium is Interactive Presentation Technology. Collaboration also aids in Students uptake. Congruence with the brand (school / lesson) is strengthened if the student can be involved in creating the educational artefact. The multi-directional interactivity made possible by interactive presentation devices provides for student input to the lesson. Therefore the student is helping to ‘co-create’ the lesson. Therefore positive affect towards the lesson increases: Learning improves: The School look better in the market. Therefore emotional reactions and attitudes are transferrable: Contagious even. Therefore if the teacher is happy presenting the lesson, the students will absorb this happiness. Based on all the arguments above it is suggested the teacher will be happier presenting lessons using Interactive Presentation Technology than using traditional presentation tools. Therefore the students will be happier when the teacher uses Interactive Presentation Technology. To read the full paper click here. The article presents various perspectives to support the adoption of Interactive Presentation Technology: Looking at what functionality is new to this technology comparative to passive presentation tools, suggesting this functionality enhances educational outcomes. The Identity benefits inherent to this functionality are explored as are the Identity benefits gained by using state of the art equipment: For Students as well as Teachers. Arguments are made asserting that modern students respond most favourably to modern presentation equipment and that this leads to better education outcomes also. So how can an educational institution incorporate that into a pitch for new students? We could start with something along the lines of ‘The state of The Art teaching tools we use maximize knowledge exchange, promoting satisfied Teaching Staff and engaged Students’. Click this link to visit a page with more video content relating to Interactive Presentation Technology.